A fun, easy and practical introduction to Korean. You'll be surprised how fast you'll catch on. Learning is fun. Learning a language is particularly fun because through communication we get access to facts, figures and people’s hearts. However, learning a language can also be tedious, imply homework, require hours that we (sometimes pretend) don’t have and most of all lead us to believe we are not making much progress, or decide we will never achieve a level sufficient for proper communication. Lots may agree learning Korean is no exception. 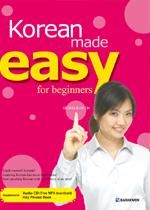 “Korean Made Easy” takes the reader along the fun route and really is: communication made easy. The course is easy to read and an easy reference book that will lead to quick results with a minimum of effort. Most importantly, as an added bonus, the reader will get interesting and valuable information about Korean culture and history which are inevitably linked. “Korean Made Easy” is more than a lazy man’s guide to Korean; it is the fun course and a great way to learn more than just Korean. For only KRW 17,000 you will get 20 self-study lessons with practical evry day convesrsations. It provides essential grammar, taught in a simple manner. It also includes listening and reading exercises. You will also get an audio CD and a key phrase book. Click on the above picture and click on the banner on the right. This will give you an outline of the book. Click the "see details" under the cover image and you'll get some samples of the pages of the book. Contact the publisher for any additional information. Mailto: lsh028@darakwon.co.kr.